Do You Trust Your Skill Come Game Time? 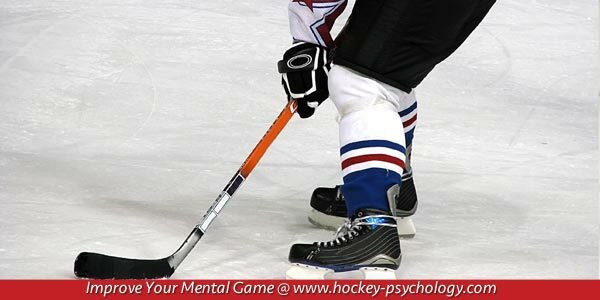 Your mental game of hockey helps you balance both learning skills and performing in competition. Do you have trouble bringing your practice game skills to competition? Many hockey players tighten up, over think and try too hard during competition, which can cause them to under-perform. You practice countless hours to perform your best in competition. But, sometimes your practice can backfire and cause you to lose trust in your game. If you are stuck in a training mindset, you’ll have a more difficult time taking your hockey game to competition. When you’re practicing, you’re in an analytical mindset. You are trying to “fix” your mistakes and improve your skills. This mindset is appropriate for practice, but can hurt your performance in competition. When you’re focused on technique, you in a learning mindset, which is necessary to improve. However, at game time you have to trust in your skills. You want to be able to allow your performance to happen in competition, rather than forcing it to happen. Eric Staal of the Carolina Hurricanes knows a thing or two about how to let it happen. Staal has a simple approach to each game, react and think less on the ice. You too can simplify your game by thinking less and reacting on the ice. One way to do that is not over-analyze your technique or “how to” perform a skill. You want to save those thoughts for practice. Instead, think about reacting with your vision and feel of the ice under you. You might feel quick on your feet or see a good pass and hit it. 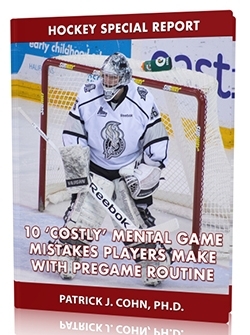 Your hockey psychology tip for today. Divide your practice into both learning and performing. Re-create the same situations that you’ll experience in competition. Allow your skills to flow and have a trusting mindset. At game time, you have to let go of technique and trust your instincts. Hi, my name is Brenden Gust and I am currently playing in the North American Hockey League (NAHL). I am the shortest player in the league and I am having a tough time figuring out my place in this leauge. I played highschool hockey last year, and I was one of the best players in the state, I was scoring, making plays, doing everything that got me to this level. Now that I am here I am struggling to play a consistant game. Speed is what has helped me excell in highschool, and even in this leauge im quicker and faster than most of the kids. Recently I’m having a tough time being consistant, scoring opportunities havent been coming as easy to me, but I know I can succeed at this level and move on to the USHL. I was just wondering if you had any tips for a smaller player on how to gain some confidence, and what other small players have done to make them succesfull. It would be greatly appriciated if you responded back. Thank you. I sent you an email with my response. Just stumbled upon your site after my son (15) has been having trouble with his game mentally. He trains and practices hard and puts everything into the game of hockey. He has the skill but when it comes to the game he is having trouble being consistant and is very frustrated that he isn’t performing the way that he knows that he can. He wants us (his parents) to help, and we try, but I think he needs more than what we have knowledge in. I believe your article is an example of what he is dealing with. When he trains, he is very focused on technique and we believe that he takes this to the game as well. I would like to know how to help him let go and just react. I would appreciate your advice. He has worked very hard and long and is trying to take his hockey as high as he can go but I feel that something in his mental game is holding him back. Jane: He has to learn to separate the practice game from playing. This might mean that he has to let go of trying so hard and the fear of mistakes or fear of failure. Hi, i have recently been reading many of your articles searching for some help with bringing my practice play, into games. I am currently a first year midget major, playing u18 aaa hockey, i am the smallest on my team, and alwasy have been, although i am the fastest on my team, have one of the best set of hands, and am also one of the smartest. My problem has been bringing my speed, and my stickhandling into play during games, the same way i do in practice. At practice i am always getting the best out of my abbilities, and displaying my skills, proving that i am one of the most skilled and smartest players on the team, however during games it is not the same. In game situations i seem to lose some of my speed and confifdence with the puck, and my ablility to control the game, the way i do in practice. I have been trying many different pre game routines, in trying to get into the same mindset, and confidence level that i have during practice, but i am not nearly as successfull as i would like to be. So i was just hoping that you may have some tips for me, on how to bring my practice play into games, and hold the same confidence that i do in practice, in games, and also be able to get the most out of all my abilities, in game situations. I was also hoping you could possible give me some ideas on good pre game routines or things i can do to get into that relaxed, and practice like mindset. It would be greatly appreciated if you could give you thoughts, thanks. The main issue is a lack of trust in your skills in games. Most of the time, this is due to worry about making mistakes or letting others down, for example. You have to play as freely in games as you do in practice without the worry about consequences of not playing well. I would also stop trying to prove yourself to others, which may be part of the problem. Do you possibly have any suggestions, or techniques on how to stay in the relaxed mindset that i am in, in practice, in games? Hey…i… I just lost it..im 15 and i play AA hockey and i used to dominate games and also dominate in varsity. I literally dropped from the first line to a fourth line nobody in about five games This year though i iust lost everything…i lost my speed, shot accuraccy, smartness,and basiclly everything. Its to the point were my dad doesnt even thing i should be playing. I have to desire to get better but when it comes to ice time i just have no confidence. Please help me out i am sick of putting myself down over this. I am 15 and I am on a Minnesota Bantam AA team. I am highly skilled but in games the confidence or pissed off attitude is just not there, causing me to be just average and hesitant with the puck. What do I do to have more confidence in my skillset and to make great plays I am capable to make in games? You don’t have to play angry, but you want to play aggressively. What’s causing the confidence to not be there during games? Is it about playing time or making too many mistakes? Many players I work with worry about making mistakes and thus play too hesitantly.